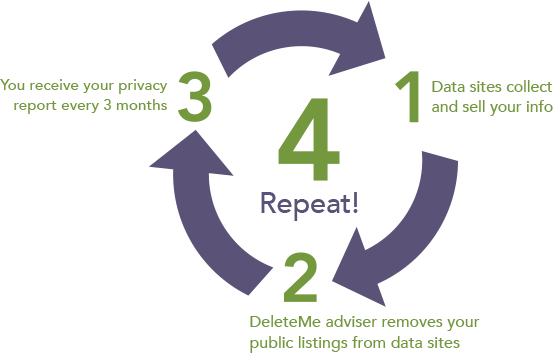 We get a lot of questions from customers about why DeleteMe is a subscription and not a 1-time sweep of deletions. The reason is quite simple: your personal information often repopulates once we remove it. A simple way of thinking about it is that your DeleteMe operator removes your record, but new information is generated about you as you continue to use the web, which can ultimately regenerate your profile in people search databases. By offering DeleteMe as a subscription, we are able to make sure your information is gone and stays gone. The FTC has said they’re cracking down on people search companies to stop this practice and we reported one company, BeenVerified, to the FTC for for claiming that it had removed customer listings, but we found them to be continually re-posting them. 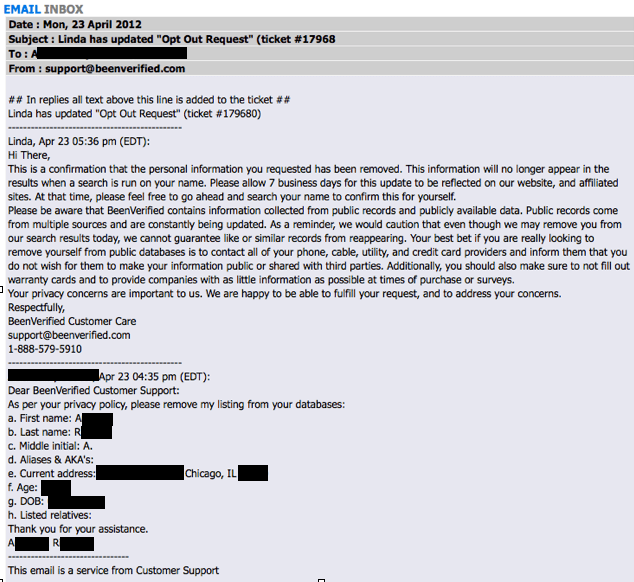 Here’s a real-life example of one of our customer’s information being re-posted. We found our customer’s name, aliases, age, current and past addresses, and list of family members. She emailed BeenVerified a removal request. Maggie’s opt-out email is below; BeenVerified’s response is above. The customer’s listing is on top. As you can see from the top right of this screenshot, I’m Sarah. It takes a village. BeenVerified is only 1 of 18 people search sites that DeleteMe removes our customers from. As you can see, it takes quite a bit of work and diligence to make sure your records get deleted and stay gone for good. This is just one customer’s story out of many, many more. Gaining and keeping control over your privacy takes effort, which is why we stay at it. And that, ladies & gentlemen, is why DeleteMe is an ongoing subscription service (or you can follow our free DIY instructions). Stay tuned for a future post on the how and why of the challenges of removing records from some people search sites! What is CISPA, and how will it affect your online life? Sarah A. Downey was a senior privacy analyst at Abine from 2010 to 2013. She's now an early stage investor at Accomplice, a VC firm in Cambridge, MA. Thanks for posting this egregious example of the flaws in these “opt-out” systems. In my own experience beenverified results do reappear, exactly as you described. OK, so where’s the link to renew? I looked and looked. It really should be front and center. Thank you.